Following customer feedback, John Deere has introduced a number of additional new features on the XUV 855D Gator 4x4 utility vehicle for 2013. These include a digital instrument cluster, a bigger capacity 55A alternator and a much larger 27.6-litre fuel tank, to enable longer working days. The dash-mounted instrument cluster displays the odometer, ground speed, fuel level and coolant temperature, engine rpm, a clock and the four-wheel drive indicator. It can be adjusted for different tyre sizes to ensure that the ground speed is accurately shown, particularly when using sprayer or spreader attachments, or driving on the road. Engine braking has also been improved, to provide better performance in hilly conditions. The vehicle’s descent control system has been redesigned to enable the clutch to stay engaged, providing more controlled deceleration down to around 3m ph. In addition, the continuously variable transmission (CVT) intake now draws in 50 per cent more air to reduce heat, as well as the amount of water ingested by the CVT system and the clutches. This leads to less belt slippage and improved durability overall. 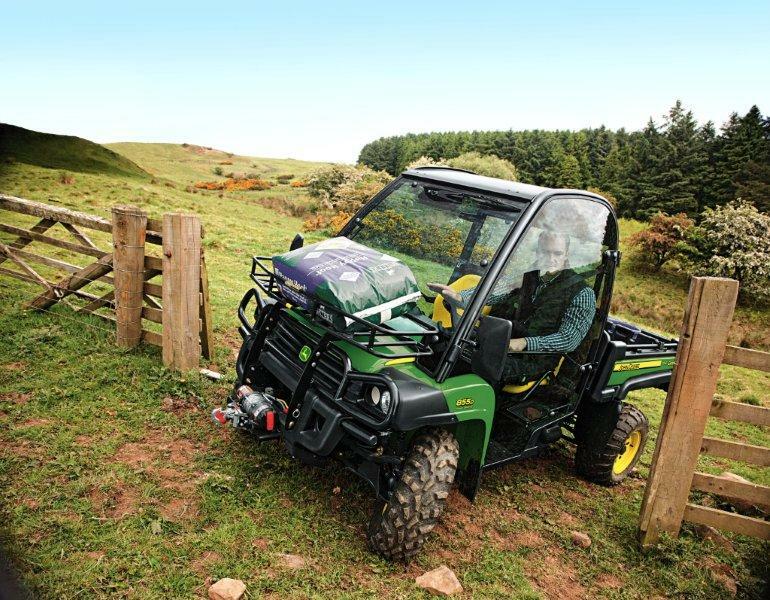 This follows the introduction of a new electric power-assisted steering (EPAS) system earlier this year, which is now standard on the XUV 855D Gator with olive & black livery, and optional on the green & yellow version. The 25hp XUV 855D Gator has a top speed of 32mph (52kph) and features true on-demand four-wheel drive, activated by a dash-mounted electronic switch, and all-round suspension, adjustable at the rear. Ground clearance is 267mm (11in), total payload is 635kg and towing capacity is 680kg. The Gator’s standard four post ROPS frame can be optionally upgraded to a deluxe full glass cab if required, and further options include tool carriers and cargo box dividers, a front mounted load rack, a bull bar and side extensions. A rear bumper and horn are now standard. Price of the new 2013 model John Deere XUV 855D 4x4 Gator utility vehicle starts at £12,227 (€14,385 in Ireland) for the base machine in green & yellow livery, fitted with standard seats and Terrahawk all-purpose tyres. The power steering option adds £512 (€602) to this model, while the olive & black version with power steering as standard starts at £12,843 (€15,110). All prices exclude VAT.